Classes can begin with a payment as little as $500.00 This course starts every Monday. It all starts with our Professional Tractor Trailer Training Program. This program provide a minimum of160 hours and up to 320 hours when needed with no additional charge. The #1 Goal of this program is your Safety! 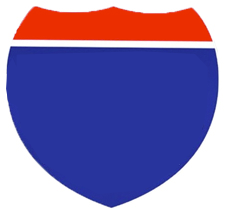 Interstate has a perfect safety record since the first day of operation, March 7th, 1998. We have policies, procedures, and equipment designed to keep all of our students SAFE! The #2 priority is to help you get your CDL license. It is important to understand that everyone learns and progresses at a different rate. We treat all of our students as individuals and we structure the training to meet individual needs. You will train until you pass the test and then take one additional week of training in the Big Rigs. That is why this program offers between 160 and 320 hours.....since everyone learns at a different pace, some drivers need more time than others to prepare for and successfully pass their driving test. We will not push you into taking the CDL test before you are confident and ready! You will have unlimited access to driving activities (backing range, simulator, and pre trip inspection preparation) to insure you will acheive the success you deserve. This class can be taken full time for four weeks and then part time until you pass your CDL road test. It can also be done part time right from the start. Students using G.I.Bill Benefits attend at least 20 hours per week for eight weeks. Once you start the program we will monitor your progress, we can then predict how long it might take you to successfully prepare for and complete the CDL testing. The 160 hours of training is a minimum required by many of the carriers that hire our students. Most of our customers will exceed the 160 hours should they need more time on the backing range or driving simulators. There is no extra charge for this additional time. We feel an obligation to every student to help them succeed and thus we do not put a limit on time they have access to these two activities. 100 Hours Of Classroom and Coursework Education. Classes can begin with a payment as little as $500.00. This course starts every Monday. The goal of the Licensed Class A Driver Certification Program is to help drivers that already have a Class A license refresh their driving skills with larger over the road tractors with manual transmissions and trailers up to 53'. Our 160 hour refresher Program has all of the elements of the Professional Tractor Trailer Program without the road test preparation. Tuition includes all text books, DOT physical, and DOT drug screen. Our Professional Tractor Trailer Course is the best course that we offer. We will help you every step of the way as you learn to properly inspect commercial vehicles, learn to back up trailers proficiently, shift properly, and drive a tractor/trailer rig safely. You will participate in class, practice your inspections, practice your backing on our range, drive tractor/trailer rigs with 6 speed manual transmissions under the guidance of our professional instructors, and spend time on our sophisticated truck driving simulators to prepare for your CDL Road Test. Students with previous experience like growing up on a farm will complete the program is 4 to 6 weeks. Students with no previous experience will continue their training part time from the 5th week on until they are successful. Once you have passed your road test and obtained your CDL you will complete the final phase of training with the big rigs. You will use the next level of simulators and learn how to shift a 10 speed non-synchronized transmission. You will have the opportunity to spend as much time as needed in the simulators to acquire the motor skills to shift the ten speed transmissions and then you will spend time with our instructors in the big rigs and complete your training. There are conditions to road tests...most importantly, students need to attend all of the their scheduled training in order to be provided with additional tests without incurring additional fees. Please contact our office and we will provide a written policy that fully explains re-test procedures. It is important for every student driver to understand that schools are prohibited by state rules to promise that you will pass your road test. We work with each individual student to provide a lesson plan to help the student succeed. That is why we cannot provide you with predetermined graduation date. Once you start your training, your test will be scheduled when you feel you are ready to succeed. If by chance you do not pass your first test, we will not charge you for an additional test as long as you (*)have a perfect attendance record for your training. You will receive additional training and then test when you feel confident. If you still have trouble with the test, we will continue re-tests until you pass without additional charge as long as you (*)continue your perfect attendance record. You have the option of taking our Professional Training Program with a manual or automatic transmission. It is important to understand that taking the program and testing with an automatic transmission will result in a restriction on your CDL license limiting you to automatic transmissions. The advantage of taking the training with an automatic is the testing process is easier and the success rate of passing the first CDL road test is higher. Students that complete this program with a manual transmission can go to work for almost any trucking company in the U.S. We have had students go to work for Werner, Halvor Lines,Knight, Swift, West Side Transport, Schneider, TMC, Transport America, Roehl, Bay & Bay, Fed Ex, Conway, Stevens Transport, Pepsi, Coke, and many more companies after taking this course. Students that have a restriction limiting them to automatic transmissions will still be able to find decent employment but their options will be limited. Please contact our office today for a tour of our campus and getting started in the right direction. Copyright Interstate Truck Driving School - 2019 - Your Career Starts Here!